This book contains surveys and new results in the area of Foreign Exchange (FX) quantitative research. FX markets are among the most liquid in the world, trading is global and almost continuous. On the contrary, there are only a few currencies contributing to this enormous turnover, namely US Dollar (US$), Japanese Yen (¥), Euro (C), Sterling (£), followed by Swiss Francs (Sfr), Australian Dollar (AU$) and Canadian Dollar (CA$). Mathematicians and Physicists have entered the trading floors of investment banks as the trading in derivatives has increased. Due to the liquidity of the underlying and the simple relationship between forward and spot prices the FX market has produced a wide variety of exotic derivatives, creating an ideal playground for scientists. Working within Global FX Options Quantitative Research of Commerzbank Treasury and Financial Products our job is to find the right price and means of risk management for such exotic options. In this book we have recorded some of our accumulated ideas which we find worth circulating among the community of quantitative scientists, product developers and traders − in spite of the existing flood of literature on options − mainly because very little has been written about FX and its peculiarities. Besides liquidity there is the inherent symmetry of a currency pair and the quotation conventions in terms of implied volatility depending on the delta of an option, the tendency of symmetric volatility smiles and the foreign interest rate. And there is the constraint on the exchange rates for three economies which have to obey a product relationship which entails a simple access to correlations between these rates. 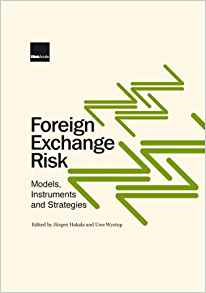 This book is a report of traditional and recent approaches to the quantitative aspects of FX derivatives. Ue discuss several products of the market and their valuation, basic mathematical tools, Greeks, volatility management and correlation management. The traditional aspect is the Black−Scholes−Merton model, which is of fundamental importance, because of its high acceptance in the market, its usage as a common language for price quotations, its rich output of closed form solutions for option prices and its numerically simple tractability. In the last part we present several recent research articles about various valuation techniques such as Monte Carlo simulation, integration using low- discrepancy sequences, binomial trees in two dimensions, finite diRerence, fast Fourier and finite element methods. These numerical methods are illustrated by stochastic volatility models, a jump-diRusion model and a model with constraints on the hedging portfolio. The chapters have diRerent authors, but we have taken some steps to make this book readable as an entity. However, the chapters can also be read individually. Ue hope you will enjoy the book as it was our intention to select and combine relevant material and make it easy to access.